Drumroll, please, ladies and gentlemen. Soon one of the most popular and enticing musicals will be coming to the Bass Concert Hall in Austin. The international Tony Award-winning musical Million Dollar Quartet is on its way to impress Austinites with a performance full of all the things that intrigue us in life: secrecy, betrayal and celebration. The plot goes something like this. The “father of Rock ‘n’ Roll Sam Phillips, launches the careers of four infamous musicians, introducing them to one another in the Sun Records storefront in Memphis, Tennessee. Million Dollar Quartet recounts the plot-twisted, fateful meeting of these musicians: Elvis Presley, Johnny Cash, Jerry Lee Lewis, and Carl Perkins, who together, set up an evening of musical celebration and broken promises. Sound fun? We think so. James Barry as Carl Perkins, David Elkins as Johnny Cash, Ben Goddard as Jerry Lee Lewis, Cody Slaughter as Elvis Presley, and Vince Nappo as Sam Phillips are the actors who star as these notorious icons. This particular evening goes down in the books as an explosion of music featuring the sounds of rock ‘n’ roll, R&B and country tunes. “Folsom Prison Blues” and “Hound Dog” are just a couple of the hits you can look forward to hearing. 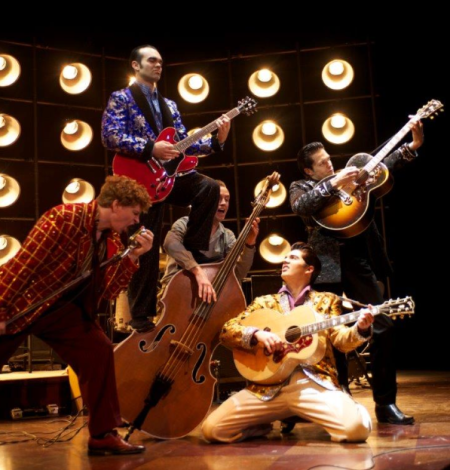 Of course, Million Dollar Quartet won a Tony Award®for Best Performance by a Featured Actor in a Musical and received a Tony Award® nomination for Best Musical and Best Book of a Musical (Colin Escott & Floyd Mutrux). The show received an Outer Critics Circle Award for Outstanding Featured Actor in a Musical, a Drama Desk nomination for Outstanding Musical Revue and three Drama League nominations including Distinguished Production of a Musical and Distinguished Performance. This show is produced by Relevant Theatricals, John Cossette Productions, American Pop Anthology and Broadway Across America. Texas Performing Arts and Broadway Across America – Austin is helming the tour that begins on Tuesday, April 9th and concludes on Sunday, April 14th. Tuesday through Friday the musical will be showing at 8PM. On Saturday there will be a matinee show at 1PM with an evening showing to follow at 7PM. Sunday will have two viewings: at 1PM and then a closing show at 7PM.